If you haven’t noticed every government on the planet have gone insane with dumping money on the ailing economies, bailing out rubbish companies, guaranteeing commercial bank deposits (hence insuring debt), bailing out dreadful banks that should have gone belly up. The term ‘zombie business’ will be used a lot in reference to a Keynesian economic model, that has been utilised by policy makers in a hyper frenetic way. With dire consequences to government budgets, public spending and economic responsibility of surpluses and the protection of currencies. A good example of irresponsible fiscal stimulus or protection is when Australia made a rushed decision to guarantee all bank deposits, all and good for the consumer. Except the Australian government was pressured by the commercial banks to guarantee commercial debt. So in agreeing to bank demands the local state government’s got played, as government (and local government) issue debt got downgraded. No one wants it. But the banks are now utilising the government guaranteed to gain a triple A rating on it’s own debt, hence investors buying bank AAA debt and dumping state and government debt – which in turn makes Australia government debt less attractive, that in turn causes governments to find it hard to raise capital through higher borrowing costs. Also keep in mind that the Australian government, much like other developed economies is in the process of giving out huge fiscal stimulus packages to the population. Which of course empties the government’s surplus and thus States will also find it hard to raise capital (as discussed – this causes government and state debt to be downgraded against bank debt). Which of course inevitably leads to government cuts to public spending, which means health, community and welfare services. This is only one example of Keynesian meddling in the economy, since policy makers have lost their minds with bail out packages left, right and center, we are going to continue to see huge distortions in the markets. All at the detriment of the tax payer. The world is most likely in Recession. How long and how deep a global recession will be is still speculative, but with markets still unwinding, particularity the credit markets. This recession could be a long one. Inflation is still jumpy, with demand for commodity imports from China slowing. The one commodity to watch will be oil and it’s extend of decline down -$44/ -$45 a barrel (current range 103-104 from highs of 147 in 11th July 2008). Yet OPEC refused to increase production and in fact cut production output. This would indicate despite the global slowdown oil still could remain at historically higher levels, compared to other global recessions and the decline in demand for oil. Risk aversion has crunched down a lot of the high yield currencies, namely the Australian Dollar in which now looks like it’s still in a corrective sell off. The AUD was one of the high yeilders based on the Australian commodity export boom, which stoked inflation, hence the high cash rate of 7.00%. Although the global slow down and lessor demand for commodities, particularly from China has shot the AUS/USD down from 0.98 (July 15th 2008) to 0.79 (current trading) . As mentioned the AUD could be in for a substantial correction it it’s value. Declines could certainly fall into mid 0.70. Much like the European dollar, with the USD strengthening (although it could still fall more), all high yielders are been sold off including gold. 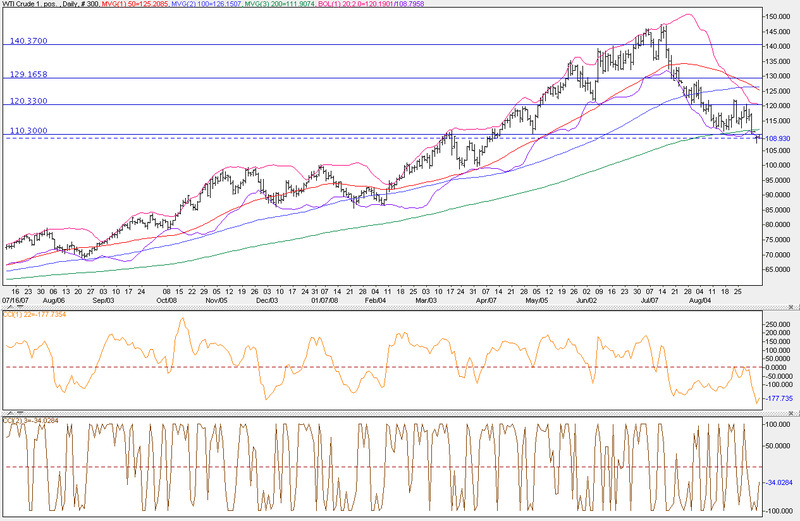 Gold looks oversold, bouncing off it new suppoert of 744, down from previous support o f 772. The trading range between those to supports is 28 points; gold looks unstable with those lower price ranges. But for a rally, you’ll need the USD to tank. So with the commodity markets (price declines effecting commodity sensitive currencies) slowing rapidly and shipping slowing down (globally) – this would be a good indication of a sharp global economic retraction. Overview of countries effected by credit, liquidity and inflation; recession conditions – Japan (Asia), Spain, Iceland, Australia – (update 10). Is Asia facing a economic meltdown? China’s central bank under strain? High debt to GDP countries are suffering as their currencies are being sold off on mass, namely South Korea, Taiwan. The carry trades are unwinding in far more widespread way, so investors are leaving any once high yield currencies. The Japanese Yen and the US dollar have risen on the back of risk aversion. This could be permanent, in the sense the global recession has kicked into gear harder than expected – anything very oversold, say the 1st and 2nd largest economies and their currencies (JPY and USD); may return some gain (although the US and Japanese stock markets appear to be falling further into a depressed bear market). Still the big worry, in my opinion, is the Chinese central bank dumping US treasures and currency on masse, due to a shrinking capital base (bought too much high risk debt from the US). Does the Chinese central bank require capital and may need to borrow externally, similar to the Brazilian central bank of the 1990’s? morbius glass: Energy markets, Commodities and Geopolitical analysis. 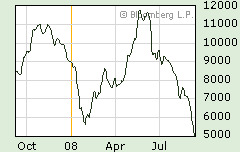 Energy Market Watch: Oil continues to fall. Oil has begun it’s retreat on cue at about the same time hurricane Gustav was downgraded on the 1st of September 2008. It was a synchronized sell off falling below the 110 technical support (the current price now at 108-109). Of course on top of the hurricane downgrading and the little effect it had on the US oil fields in the Gulf of Mexico, is the current global slow down. Still, as I mentioned in Oil lower, volatility market reaction. Oil now showing price instability. Could the mother of all oil shocks be brewing? the oil price is becoming unstable with new lows. Iran and Venezuela have requested that Opec cut output if oil falls to $100.00. The psychological support for oil is 100, any lower and we may see a crash in the oil price. Which could be somewhat unlikely, if Opec stand in, Iran tightens output (although another competing oil producer may increase output at the same time) and another hurricane threatens the Gulf of Mexico, or a conflict. This could reiterate the concern of a large spike in the oil price. The stable range from a technical perspective is between 120 and 110. As most of the global economies have had their GDP crunched, the overall indicator (or consensuses) is a global slowdown or recession. The US has slowed considerably, contributing to estimates that the world GDP will fall to -0.8 %. The US economy is by far the catalyst to the global economic crisis, the Federal Reserve slashed their interest rates down to 2.00%, at a time when inflation globally was a problem (and still is); other central banks sent confusing messages with interest rates, some increased rates like the European Central Bank (although tentatively) and the Australian Reserve Bank, Brazilian Central Bank among others; in which now there could be a slashing of interest rates by most of the developed economies central banks, with the US possibly starting to raise rates. It is overall a disproportional global economy that is now unhinging quite dramatically. The UK, Ireland and the EU are all now most likely in a recession, Asia Japan, Singapore, Malaysia and Korea are also in recession, with Asia/pacific countries such as Australia and New Zealand technically falling into sharp recessionary conditions. Effecting the slowing economies is the retraction of the credit markets, or as it was better known just over a year ago; the credit crunch. But the credit crunch quickly became known has the ‘credit crisis’, as the credit markets literally froze up. The CDO (collateralized debt obligations) markets became untouchable and the damage to the banking system has been dramatic with an overall erosion of confidence in that sector. The credit crisis hasn’t even gone half way through and there is still no end in sight. As discussed in Global recession tipping point, gold over sold, oil price shock on the cards. Bank losses continue, the bank failures in the US should be about to occur, most probably all at the same time. Just recently the FDIC has warned that 117 banks could go into bankruptcy, this is of course and underestimate as we may see the hundred plus number appear. The LIBOR rates are showing a tighter and progressively more cautious market with interbank lending, which would indicate the mistrust that the banks have with each other other disclosed toxic assets sitting in undeclared accounts. It will be interesting to see how far the credit crisis reaches the consumer, that has become so leveraged with credit cards to cover high inflation (costs) on food, oil and everything else. The big question is, could the banks at some point cut credit lines to consumers. This is a distinct possibility, if the credit markets do not normalize anytime soon. But the US economy is in a dysfunctional and confusing state, with a cash rate so low, high inflation, the stock market has had sporadic rallies, then dramatic sell offs, the commodity markets namely oil are (in my opinion) showing instability and volatility with pricing – that appears to be pointing to a large spike at some point in the future (please refer to:Oil lower, volatility market reaction. Oil now showing price instability. Could the mother of all oil shocks be brewing?). The US export markets are solely contributing to the US GDP, but for how long? If the USD strengthens and the rest of the world falls into recession – this will most certainly effect American export sales. The recent US dollar rally is a good indicator of Europe and the UK’s slow downs, with also parts of Asia slowing too. The USD was one of the most oversold currencies, but I still see some further selling of the USD. If the ECB decides not to cut rates (which I don’t suspect they will do), the EUR could rally. But oil is going to be the USD’s worst enemy, the oil price needs to stabilize before the USD can really regain ground. This could happen if the Federal Reserve increases interest rates, but any rise in the USD would be offset by a major conflict in the middle east, or a new cold war with Russia (Russia could cut it’s oil output). The commodity markets haven’t finished their bull run. The food markets will fluctuate again, as the developing countries may have crop failures and the festival season in India kicks off; so demand will increase for Rice, wheat, sugar, even Bananas could be at peak production cycles; we could see a major price hike in all food commodities depending on the demand from India and China. Of course this leads to inflation. 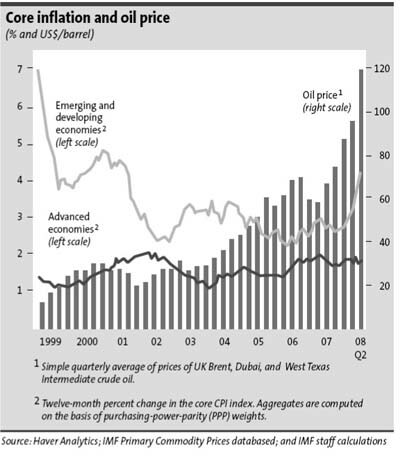 All economies are grappling with high oil and food prices, we may not see this diminish. The commodity inflation issues, as mention above could solely be a demand issues and scarcity issue. We could be peak commodities, depending on how robust the mining industry can continue output on iron ore and other metals. But peak phosphorous is just around the corner, we could see other metals and minerals peaking also.